The Driver and Vehicle Licensing authority[DVLA] has been exposed on a cheating scandal relating to new motorbike registrations. 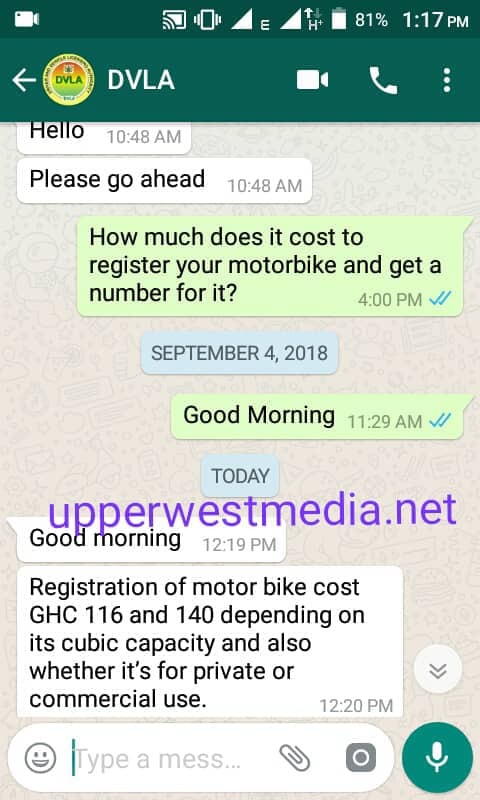 A new motorbike in upper west is supposed to be registered at a cost of Ghc 116 and 140 instead of Ghc350.00, this started in 2016 after it was initially Ghc250 in 2014 and Ghc300 in 2015. Motorbike owners are compelled to get their motorbike registered not withstanding the highly inflated cost of registration. MTTU department of Upper West due to this have started harassing motorbike owners. At a point motorbike owners were issued with pre-notice to prepare to re-register their motorbikes that were registered not later than 2014, this angered people in upper west who suggested this has never been heard anywhere. The DVLA as at now charges new motorbike owners Ghc350 to get a number plate. Investigations carried out by upperwestmedia.net proved otherwise per supposed charges to be taken by the DVLA. According to the Public Relations Officer. This clearly showed that the Upper West DVLA was siphoning monies from the Public under false pretense. Records upper west media have proves the Upper west DVLA registers not less than 8000 motorbikes annually, meaning within 2014 to 2018 the Authority has registered not less than 24,000 motorbikes meaning Ghc350 multiplied by 24,000 would total Ghc 8,400,000 that is Eighty four billion old cedis instead of generating Ghc 140 multiplied by 24000 which total Ghc3,360,000 old currency thirty Six Billion. So in Excess an amount of Ghc5,040,000 thus fifty Billion and for hundred million old cedis was siphoned from the public which can’t be accounted for. The Public have expressed disappointment in the level of rot in the DVLA and call on government to prosecute and dismiss people who endulge in such acts. Records show that people from Bole, Bamboi, Sawla, Tuna, Damango in the Northern Region come to Upper West to register their Motorbikes. An official letter is yet to be issued to the Auditor General, Daniel Domelovo by Upper West Media Group to for see to the Issue. September 17, 2018 in Business. People of the upper west region should wake-up and stop been stupid. How on earth can anyone buy a Motor Bike that is not registered. We don’t build Motor Bikes and every imported Bike MUST pay taxes.